This dish goes back to 1960s Spain, where it was served by Swiss chefs Otto and Urs Müller at El Bulli, the beachside shack in the coastal town of Roses they transformed into a legendary Michelin-starred restaurant. 1. 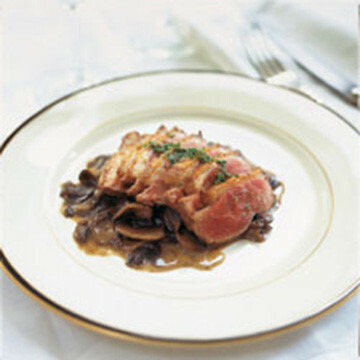 Put brandy and truffle juice into a deep glass or ceramic dish, add duck, cover, and marinate in the refrigerator for 8 hours. 2. Preheat oven to 400°. Heat a large skillet over medium heat until hot but not smoking. Remove duck from marinade, reserving marinade, and pat dry. Using a sharp knife, score duck skin in a crosshatch pattern. Season duck all over with salt and pepper, then cook in hot skillet, skin side down, until skin is golden brown, 8 - 12 minutes. Turn duck and cook for 1 minute more. Transfer duck, skin side up, to a shallow baking dish and set skillet aside. Roast duck for 3–4 minutes for rare. Remove duck from oven, loosely cover with foil, and set aside. 3. Pour off all but 5 tbsp. of the rendered duck fat from skillet and return skillet to medium-high heat. Add mushrooms to skillet and cook until golden, 8–10 minutes. Stir in reserved marinade and add truffles. Carefully ignite marinade with a kitchen match and allow flame to burn for 1 minute, then add stock. Increase heat to high and cook, stirring often, until sauce thickens, 20–25 minutes. Remove skillet from heat and whisk in truffle butter. 4. Divide mushrooms and sauce among four warm plates. Slice duck, divide evenly among the plates and garnish with parsley.